Ten years ago today, life went in another direction. It is still good. Well, after a LOT of work by me it is good. Different but good. I'm still alive 😉 which is no small thing. Still riding the metallic orange Waterford that traveled Route 66; it is now red. In fact, after more than ten thousand miles and 5 x 1200Ks, it needs a(nother) new paint job. Danny & I have moved and it's turning out to be good. Even Bella is happier. She still sleeps on me when I'm stressed which is pretty rare. Hardly ever happens. This blog had a 'quiet period' during which I did a stint at Google as an IC. I did some good work for them... which you can see the evidence of in daily headlines announcing new products. Then a coworker found this blog and decided to cast political shade on me. Worked well for her... Google decided it wasn't an issue... or maybe 'didn't happen'. Bella was taking care of me a LOT during that time. Now she plays with organic catnip and sleeps. Speech therapy. Writing a blog was part of that. Espresso, pour-over, presspot, mokka, drip. Caffeine in all its glorious forms. Everything above is ongoing...that's how life is different now. Recovery is ongoing. One thing TBI survivors have to be really REALLY careful about is exposure to chemicals. Everything from medications to environmental exposure to herbicides. This is a good day, because it's the end of the collective denial about Roundup. And it's the beginning of a new chapter where glyphosate will cease to be sprayed everywhere to control weeds and make the neighbors happy about your neat-looking, carcinogenic yard. Yes, more than one neighbor on our beautiful street in Silicon Valley recommended it. You know what would take care of those weeds? 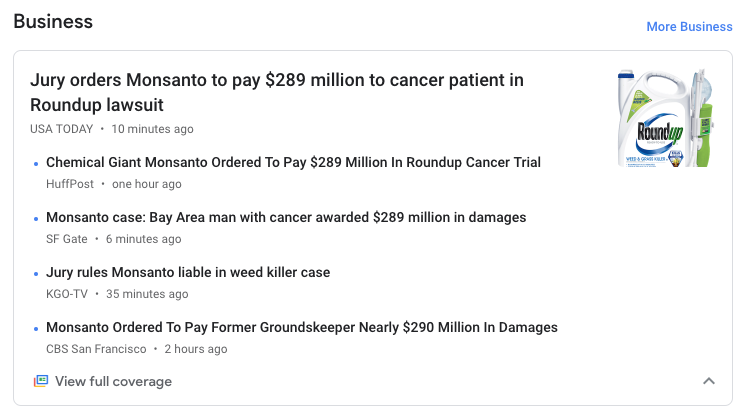 Roundup! It's totally safe! Takeway #1: Stop using Roundup - it's not safe. The plaintiff, Dewayne Johnson, and his family paid an unacceptable price for our denial. He's got an aggressive case of lymphoma. The jury awarded him $289 million partly because his health is gone. They assigned a number to the years he's not expected to live. Monsanto stole his health for their own profit, that's why the story is in the Business section. Their lawyers and accountants told them it was worth the risk of a lawsuit someday. So this good day is mostly for the rest of us. We get the gift of less Roundup for our bodies to process. We get large corporations like Monsanto (and many others) who are forced to adjust their practices. We get hope for a healthier future. Takeway #2: Some day you may need a lawyer. I feel grateful for Mr. Johnson and his legal team. They fought hard for us. I regularly hear smack-talk about lawyers and lawsuits, and noticed something. It seems to come from humans who have been lucky so far and are ignorant of that fact. They haven't accidentally dosed themselves with a carcinogen. Been gravely injured in a car wreck. Been born female, or a person of color (or both). Make no mistake, ladies and gentlemen - lawyers are occasionally required. They were required for me and this journey. They were the good guys. FYI farmers regularly spray Roundup on wheat and other crops right before harvest. You've been ingesting Roundup without knowing it! Buy organic to avoid glyphosate in your diet.